Wincanton Town Council has secured funding from Somerset County Council to deliver a one night a week youth club for young people aged 11 to 19. Somerset Rural Youth Project (SRYP) successfully gained the contract and has transformed The David Sharp Centre into a space now enjoyed by young people. 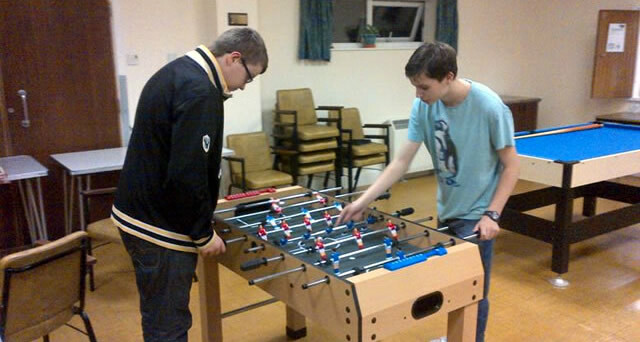 The youth club is open on Tuesday evenings from 7.00pm to 9.00pm; indoor activities such as table tennis, football and pool are available as well as an exciting programme of other activities to take part in. It costs 50p a night and food and drink can also be purchased from the kitchen which sells healthy foods such as non-fizzy drinks, toast and cereal, all at low cost. The youth club is ran by two paid, qualified SRYP youth workers but they really need some local help from residents and are seeking volunteers to come forward to help with arts and craft, sports, games, chatting to young people and helping out in the kitchen. If you feel that you are able to give a couple of hours a week please contact Andrea White 01278 722100, .